Do current state pension plans ensure a comfortable retirement for most teachers? 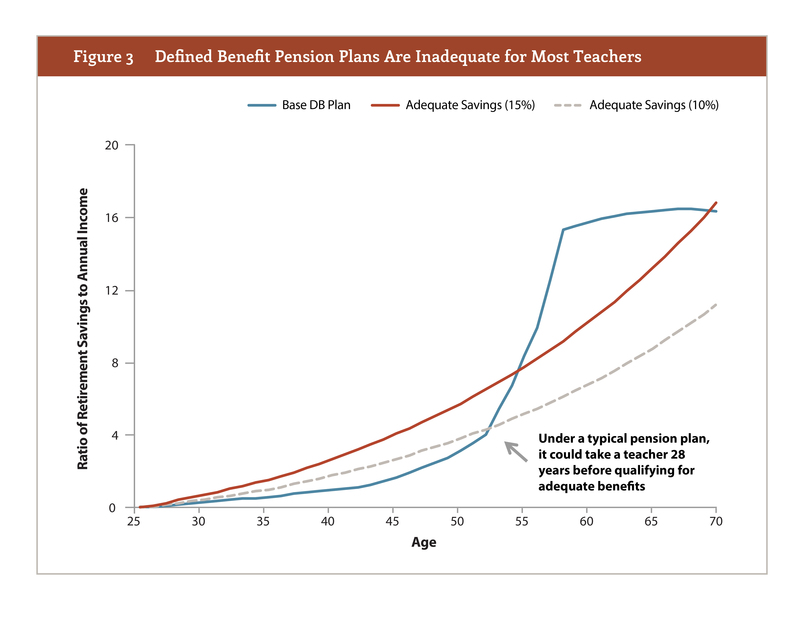 “Insufficient: How State Pension Plans Leave Teachers With Inadequate Retirement Savings” establishes a framework to compare teacher retirement plans against an “adequate” annual retirement savings threshold. After defining those thresholds, the paper measures how the typical defined benefit (DB) plan covering public school teachers stacks up. The authors find that the typical teacher pension plan provides only a small group of long-serving veteran teachers with adequate benefits. For new, young teachers, they must stay at least 28 years before qualifying for adequate retirement benefits. To afford a comfortable retirement, teachers who fall short will have to work longer, save more in their personal accounts, or rely on other forms of income in their retirement years. In contrast, the paper finds that cost-neutral alternative plan designs — including a 401(k)-style defined contribution plan, a hybrid plan combining a smaller pension and an individual account, and a type of defined benefit called a “cash balance” plan — all outperform the typical teacher pension plan in terms of providing the largest possible share of workers with adequate savings. As the report makes clear, there is no one-plan-fits-all model that would apply in all states. However, the authors recommend that all state retirement plans add features to ensure sufficient savings for the greatest number of teachers. These features include account portability, so teachers can take their savings across state lines; shorter vesting periods, so teachers begin earning a benefit sooner; and Social Security expansion, so all teachers can at least rely on the portable, progressive safety net offered by Social Security. At a minimum, state legislators should aim to provide all workers with adequate retirement benefits, regardless of how long they work. To accomplish that goal, state leaders should measure whether the teachers in their state are receiving adequate retirement benefits, and then adjust the state’s retirement plans accordingly.